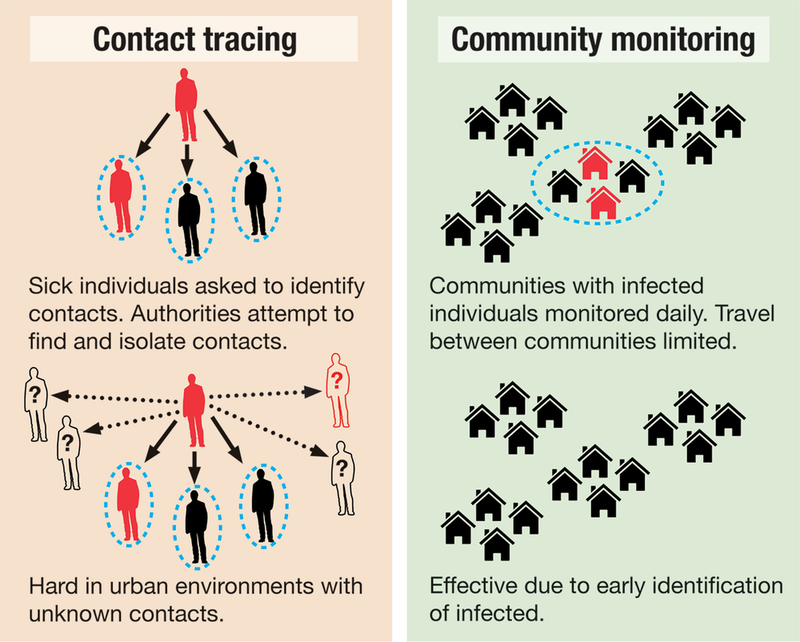 D. Cooney, V. Wong, Y. Bar-Yam, Beyond contact tracing: Community-based early detection for Ebola response, PLoS Currents Outbreaks (May 19, 2016, in press). The 2014 Ebola outbreak in west Africa raised many questions about the control of infectious disease in an increasingly connected global society.  Limited availability of contact information has made contact tracing difficult or impractical in combating the outbreak. We consider the development of multi-scale public health strategies and simulate policies for community-level response aimed at early screening of communities rather than individuals, as well as travel restrictions to prevent community cross-contamination. Our analysis shows community screening to be effective even at a relatively low level of compliance. In our simulations, 40% of individuals conforming to this policy is enough to stop the outbreak. Simulations with a 50% compliance rate are consistent with the case counts in Liberia during the period of rapid decline after mid September, 2014. We also find the travel restriction policies to be effective at reducing the risks associated with compliance substantially below the 40% level, shortening the outbreak and enabling efforts to be focused on affected areas. Our results suggest that the multi-scale approach could be applied to help end the outbreaks in Guinea and Sierra Leone, and the generality of our model can be used to further evolve public health strategy for defeating emerging epidemics. The number of infected individuals over time in a simulated epidemic including community screening. The dotted vertical line marks the beginning of the community-level screening intervention, and the different colors represent varying levels of compliance to that intervention. The greenest line represents no compliance and uninterrupted growth. Infections decline for just 40% compliance, and rapidly fall at 60%. Theory matches Liberia epidemic: Simulated epidemic including community level intervention starting in mid September having 50 percent compliance (blue) compared to actual number of Ebola patients in Liberia (red), which adopted such an intervention. 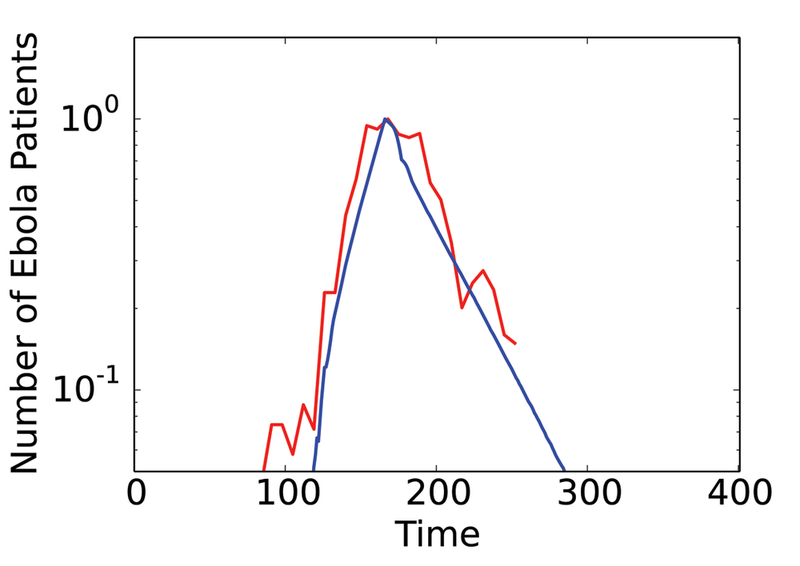 Impact of travel restrictions on epidemics: Comparison of the length of a simulated epidemic with travel restrictions (blue) and without travel restrictions (red) at various levels of compliance to a community-level intervention. Travel restrictions are able to compensate for low compliance and shorten the length of the epidemic. Did Authorities Use the Wrong Approach to Stop Ebola? Each square represents an individual: grey are uninfected but susceptible to infection; yellow are infected in the latent period and not yet infectious; red are infected and infectious; black are either deceased or recovered; and light blue are isolated by community screening policies. Colored blocks represented communities: all communities start as grey; blue have past the monitoring period and are confirmed unexposed; yellow have no active infections but are still being monitored; and red have active and infectious cases. After the outbreak is recognized, community screening is put in place. At first there are a lot of red communities, but, as containment goes into effect, red zones become surrounded by yellow and begin to contract until every community is blue, or cleared. Confirmed Ebola cases over time by country. Video by Alfredo Morales.